Geoffrey Wiseman adds to his documentation of DemoCamp Toronto # 24 with videos of James Standen, Datamartist and Oshoma Momoh, 5 Blocks Out. Datamartist is a piece of Windows software designed to enabled the extraction, transformation and and load (ETL) of data from SQL databases, Access databases, Excel files, and other sources. The goal is to help IT analysts and developers in small and medium sized businesses or departments in larger organizations to access and manipulate data needed to inform their organizations. It’s a great piece of desktop software that is for sale (imagine that!). The best part, James Standen informed me a few days before the demo he was concerned because he was still working on getting the code to work. I love demos of functioning code. Osh and Katrin presented their local community built around enabling neighbourhoods, 5 Blocks Out. The tool is built around helping communities share, discover and engage with their community. It is about those things that make your city great. The schools, the daycares, the restaurants, the spots, the excursions, the places off the beaten path that make a city a great place to live. You should check out 5 Blocks Out. Geoffrey thanks for capturing the video. Make sure you check out Geoffrey’s Toronto Tech Jobs blog where he examines and breaks down the technology job postings. Whether you agree with it or not, it’s a great way to start to critically think about employers (and their HR departments). This entry was posted in DemoCampToronto24, Toronto and tagged 5blocksout, datamartist, dct24, geoffreywiseman on December 22, 2009 by davidcrow. Geoffrey Wiseman has published Adam Thody’s presentation on DataTO.org at DemoCamp Toronto # 24. It’s great to see Adam and Mark Kuznicki sharing the great work they have been doing for toronto.ca/open to reach out, engage, educate and inspire Toronto software developers about the opportunities that exist in remixing the city data sets in their applications. The enablement of local businesses like 5BlocksOut, HomeZilla and others will be great. This entry was posted in DemoCampToronto24 and tagged dataTO, dct24, thody on December 15, 2009 by davidcrow. 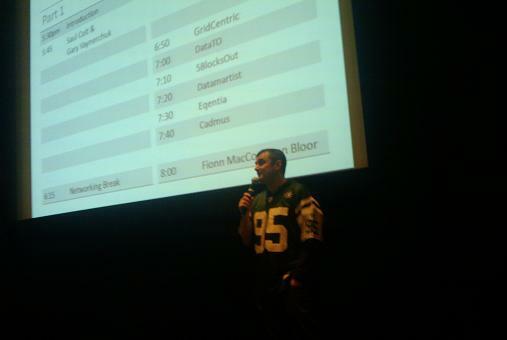 Geoffrey Wiseman has posted his recordings of Tim Smith from GridCentric at the DemoCamp Toronto # 24. As Tim says “it’s fork() for the cloud”. And the Q&A with the audience. One thing I hope Geoffrey is doing, is clearing the publishing of the videos with each of the participants. I’m think it’s great to be able to extend the reach of the event for the participants, however, not every demo goes well. And many demoers are getting feedback and need to feel like they have the freedom to do this without a black mark on their permanent record. That said, I’m glad someone captured the presentations, and is starting to publish them. This entry was posted in DemoCampToronto24 and tagged dct24, democamp, geoffreywiseman, gridcentric on December 11, 2009 by davidcrow.